What is Goalball? Sport Club for Integration (S.C.I.) "Vitosha"
The Goalball has been created especially for people with visual impairment in 1946 by the Austrian Hans Lorensen and the German Sep Reindle – both wishing to help for the rehabilitation of the visually impaired war veterans. The game was presented to the world in 1976 at the Paralympic games in Toronto, Canada. The first competition took place in Australia in 1978. Since that time the popularity of the goalball is growing progressively in different regions of the world. The goalball is played by two teams of 3 competitors. The Ball weighs 1.25 kg and ball's circumference is around 76 cm. Inside the ball there are bells and the competitors orient due to their sound for the place of the ball. It is necessary to point out that the ball is not under air pressure, as it is in the football, basketball, volleyball etc. The ball is made from hard rubber. In order the bells to be heard more clearly, the ball has eight small wholes through which the bells’ sound is coming out. The competitors have eye-shades on their eyes. The function of those eye-shades is for players that have some rest of sight not to be able to use it, but to orient themselves only by their hearing. 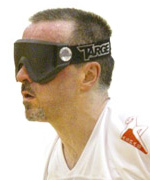 In the contemporary goalball the eye-shades are not enough for preventing from incorrect play. There are competitors that move their eye-shades aiming usage of the rest of their sight and in that way they are automatically in front of their opponents. Due to that unfair fact, the International Blind Sport Association (IBSA) past a rule according which before the competitor to put the eye-shade on the face, special plasters should be put which insures additionally the certainty that the player could not use the rest of his sight. Court. The goalball is played in a sport whole and the court sizes are 9 M width and 18 M length. The court is divided into 6 3-meter areas. 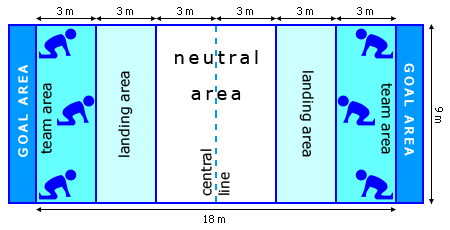 The first area is the defense area which starts from the goal-line until the 3rd meter. In that area the defenders should block the ball in order it not to come in the goal, i.e. The ball cannot be neutralized before that area. The second area is the throw area. It is situated between the end of the defense area – from the 3rd until the 6th meter. The thrower when reinforcing him for the hit, he/she can go to that area and from there he/she can throw the ball. The next area is the neutral area. It is situated from the end of the throw area – from the 6th until the 9th meter or to the central line of the court. That’s how in the center there is the 6-meter neutral areas. The game is played with goals during two halves of 10 minutes each clear time. The competitors are divided as follows: the goal is wide nine meters and every competitor should cover a zone of three meters and the goalball player that is in the middle is in front of the others in order not to crash one another. There is also a version that the competitors play in the same line, i.e. They stay or at the goal-line, either at the 3-meter line, but for that version of play it is necessary to have trained a lot and gained synchrony and it cannot be said with certainty that it is a more successful way of playing. The ball is caught or hit away by the competitors of the defending goal side. Undoubtedly, one of the most interesting parts in the goalball play is the refereeing of penalty throw. Penalty is given when the attacker makes a larger reinforcement and the ball does not touch the throw area, but its first touch with the floor is in the neutral area. Another case is when the ball touches the throw area and after that jumps over the 2 neutral areas. In those cases the violator defends alone the whole goal, and the other two goalball players are led out by the referees from the court. Penalty throw is also given when the ball is kept for longer time than 10 seconds in the team. The counting of the 10 seconds starts from the moment when the ball touches somebody’s body from the defending team. That condition makes the goalball exclusively dynamic and interesting play. Penalty is given also when one of the competitors throws three throws in a row. Every player has the right for most two throws in a row. Main task of the central player is to follow for the throw sequence of his team members and to warn them in case of forgetting and make an attempt for a third throw. Equipment. The competitors are equipped with shorts and t-shirts, but leggings can be used too. Necessary condition is equipping with knee-pads, elbow-pad, protecting materials on the thighs in order not to get contusions when touching the floor with their bodies. Also equipping the intimate areas of the body with protectors is necessary because the ball is quite heavy. It is 1250 G. For many of the teams it is possible to observe the tendency the goalball to be played with gloves. Usually door-keeper’s football gloves have been used. So, the equipment is very diverse. The goalball equipment consist different fragments of equipment of many types of other sports. Competitions. Goalball is played by people from all ages. There are men, women and mixed teams. However, in Bulgaria the goalball among the ladies is not very popular. Goalball European, World etc championships are organized. It is also a Paralympic sport. Many regional tournaments have been organized by different sport organizations. In Bulgaria until the beginning of the 90’s of 20 century the goalball has been an exclusively well developed sport. Undoubtedly one of the greatest successes of the Bulgarian goalball is the participation of the National team in the Olympic Games in Seoul in 1988. The National Championship takes place regularly and with a big number of teams. The administration of that sport and not only of that sport, is done by the Bulgarian Blind Union in cooperation with the Department responsible for sports among the people with disabilities at the Bulgarian Sport Union. However, after the political change in 1989 and the following economic stagnation, the only collective sport for visually impaired practiced in Bulgaria has died completely.